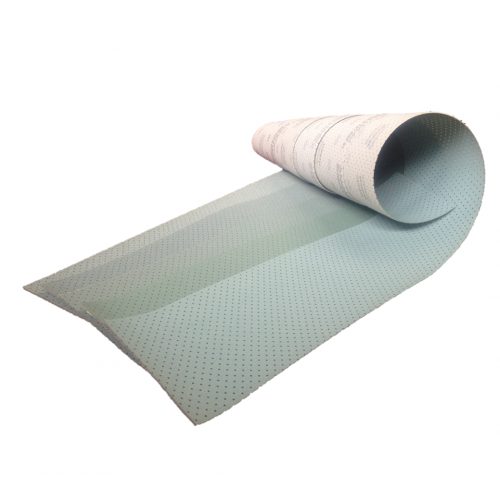 offer excellent cutting properties and has an extremely durable and tear-proof film carrier. Jost Abrafilm multi-hole abrasives are perfect for the craftsmen who are sanding anything from all wood's, epoxy's, resin's and metal's due to its highly durable and tough ceramic grain that sharpens as you use it. The 150mm x 18m size allows the user complete versatility to cut the strip into a rage of shapes from strips to discs, and due to the multi-hole design you don't have to worry about what hole configuration your machine has! The overall perforation of the abrasive in combination with the multi-layer structure of the Velcro-type system guarantees the continuous dust extraction over the entire surface, provides optimum sanding results and a much higher service life. Thanks to the overall perforation, the patented useit¨-ABRAFILM discs fit on all sanding machines available on the market, irrespective of the different hole pattern and number of holes in the backing plates. This ensures 100% availability and major savings in storage costs.